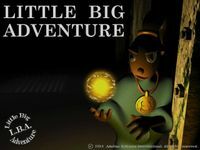 "Little Big Adventure is viewed from a pseudo 3D isometric perspective (the game field is rotated 45 degrees). All characters and vehicles in the game, including some props in the world, are real 3D polygon-based objects, allowing for full rotation and movement abilities. After completion of certain tasks the player is presented with a full motion video sequence. The character the player controls is called Twinsen, who has 4 different modes of behavior, each of which is useful in the different situations players encounter. Twinsen also has an inventory where he can store objects he finds. The game is set on the fictional planet Twinsun, which has a sun for each hemisphere. Four species populate Twinsun; Quetchs are similar to humans, Spheros are round creatures, Grobos resemble anthropomorphic elephants and Rabibunnies resemble anthropomorphic rabbits. All peoples of Twinsun have been herded into the Southern hemisphere by the tyrant Dr Funfrock, who has subjugated the planet with an army of clones which travel using teleport machines. The player character is a young Quetch named Twinsen, who has been incarcerated in an asylum because of his prophetic dreams." Source: Wikipedia, "Little_big_adventure," available under the CC-BY-SA License.